Players partner up and start on sideline. Defenders put hands on Offense shoulders while Offense drives across the floor through the pressure. Offense takes power dribble stance and faces baseline. Player 2 puts forearm on Player 1’s inside shoulder and gives contact. Player 1 then step-slides up the court. Player 1 will be advancing the ball while Player 2 is trying to ride him out on his inside shoulder. It’s Player 1’s goal to cut into the path of Player 2 and veer behind him. Once there his goal is to stay on the inside position by keeping contact. 1 on 1. Offense and defense each have two basketballs. The boundaries are marked by cones. If the offense gets their shoulders past the defense they receive a point. If the defense forces the offense to change directions, lose the basketball or go out of bounds they receive a point. Play to seven, then change offense to defense. Slot Euro Pass: 1 minute on the clock. Player will attack off the dribble from the slot, pivot and pass to coach on opposite slot. If Player delivers pass on target to coach, he will be rewarded with a shot on the weakside wing. If the pass is not on target, coach will drop pass and let it roll away. Hitting the shooter in his or her "shooting pocket" makes a huge difference in the shot going in. Even in the NBA when players have to reach up, down, or sideways to catch the ball, it throws off shot preparation. 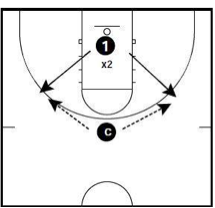 You can run this drill from any area on the floor where your offense has penetration opportunities for passes to where your drive and space spots are. Players will start on the baseline. One on offense with a basketball and the other on defense. Player one must dribble around a chair which is outside the 3pt arc, player 2 must sprint around a corresponding chair at the same distance from baseline. Player 1 starts under the rim. He must find a way to get open, if he does the coach will deliver a pass. It's then 1 on 1 with a limit of three dribbles and one shot. Offense stays if they score. If Player 1 fails to get open within a time limit of five seconds, then his possession is over.